A structure emulating the protective husk of the meteor that crashed into Fort Rox, except now it is being used to imprison mice instead of protect them! With a loud crack, the sphere quickly shatters and surrounds the unsuspecting cheese thief, locking them away within their own prison dimension. The Meteor Prison Core Trap can be purchased from the Fort Rox Trapsmith in exchange for 1,200,000 gold, 1 Meteoric Core Fragments, 10 Bloodstone, and 60 Howlite. 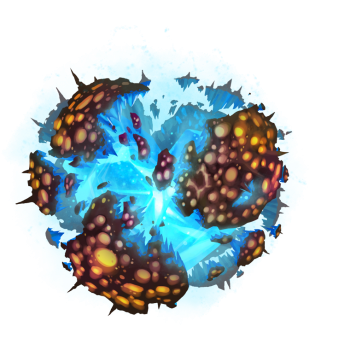 15 March 2017: The Meteor Prison Core Trap was introduced as part of the Heart of the Meteor expansion to Fort Rox.